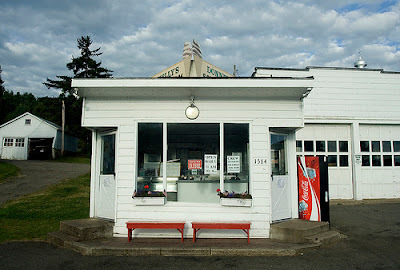 Operating out of a former Dairy, Donnelly's Ice Cream features the creamiest homemade soft serve. Each day, only one flavor is available, always twisted with vanilla. Weekends are always chocolate, while weekdays alternate through fruit, nut and other flavors. Last I visisted the flavor happened to be Strawberry, but no matter the flavor, you can't go wrong! The shack, located at the intersection of Routes 86 & 186 is located in between the Paul Smiths College / Lake Clear Airport area and the village of Saranac Lake. Make a stop on the way back from the Saranac Inn Golf Course or just go for a drive. The mountain vista that faces the shop is pretty impressive in its own right. 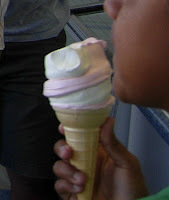 Donnelly's is open Memorial Day through Labor Day and should not be missed by any ice cream lovers. Til next year! I totally agree! Best ice cream in the world! Their cherry cheese cake, blueberry and vanilla combo with hot fudge, sprinkles and nuts is amazing! TRY IT!